Sometimes, a project listed on homify does exactly what it says on the tin. 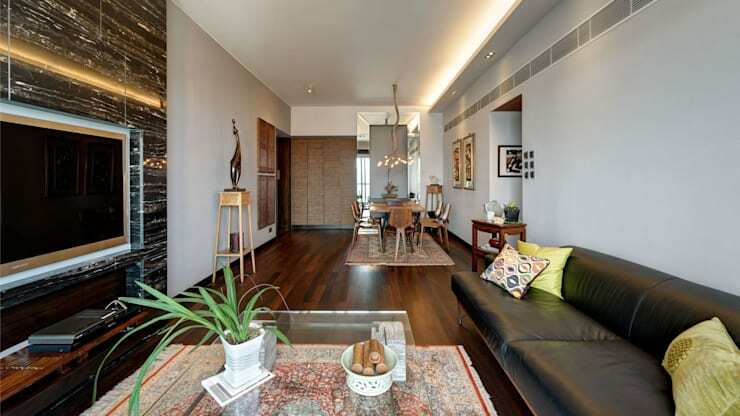 This is certainly true of the Hong Kong home below, labelled Oriental Vintage on this site. As that title suggests, the interior is an Asian-inspired one with a hint of the past about it; but it also has a strong thread of contemporary influence running through it. 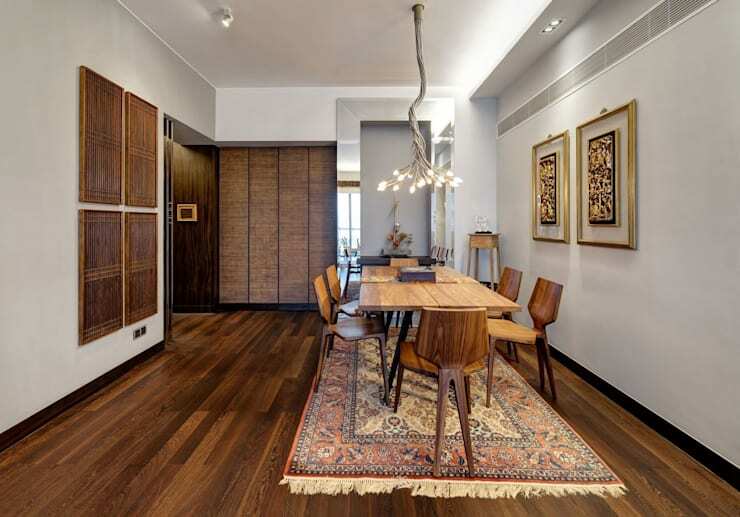 Take a walk around these beautiful rooms with homify to learn exactly what that looks like. 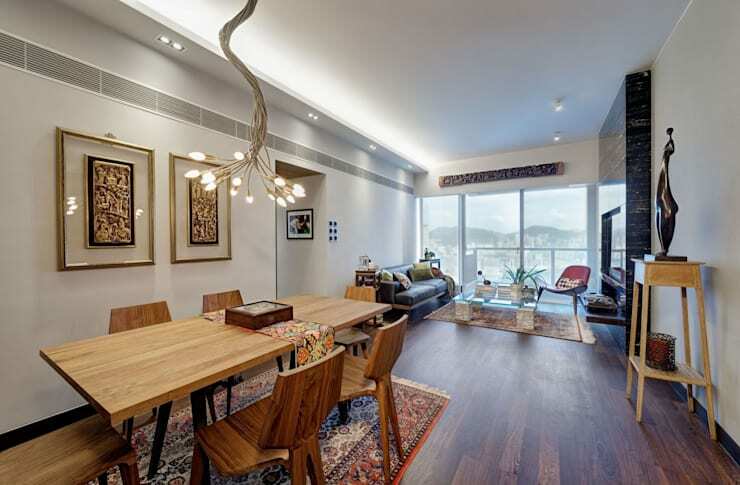 In the open plan living and dining space, touches of vintage inspiration soften the edges of hyper-modern features such as the unusual cluster of hanging lights that grows from the ceiling like an inverted tree. The rich, warm wood tones that dominate the colour palette contrast sharply with the shiny newness of the silver frame of the recess seen in the background. Although the silhouette of the furniture itself is fresh and clearly contemporary, the rug beneath, the textured wall panels and the choice of framed artwork all speak to a deep respect for the past. Here we can more clearly see those incredible lights, as well as getting a better sense of the overall layout of this part of the house. Over in this section of the room, the use of another one of those beautifully traditional rugs helps create a sense of consistency with the dining area. Here, too, the walls play an important part in establishing the desired atmosphere. 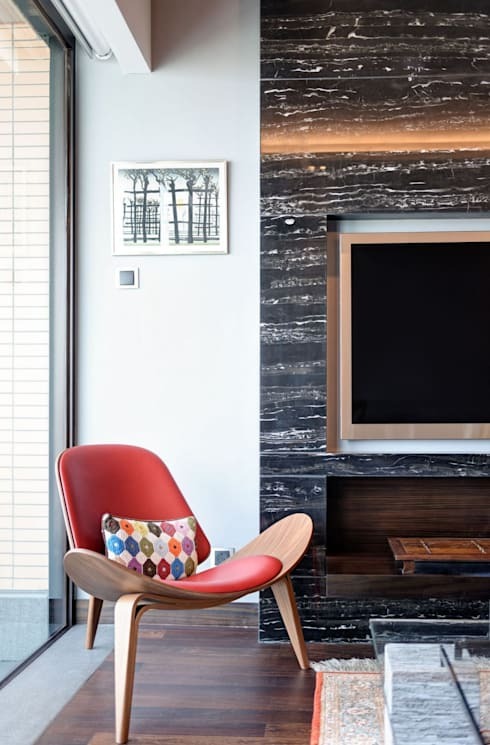 The marble panel is the perfect ambassador for the old world in the new; the smooth, regal quality of its surface holds echoes of the splendour of a bygone age, but the dark tone chosen and the very purpose of the panel’s existence – to house the TV – couldn’t be more of the here and now. A closer look reveals the gorgeously clear quality of the panel’s patterns. It’s also worth noticing how the chair seen here fits into the overall feel of the interior. It has a whiff of the 60s to it, sure, but its smooth curves are still a world away from that much older variety of vintage suggested by the marble panel and the opulent rugs. Getting any real amount of work done could be a serious challenge with that stunning view across the city acting as a distraction. But turn the chair around and the view would be pretty impressive as well. 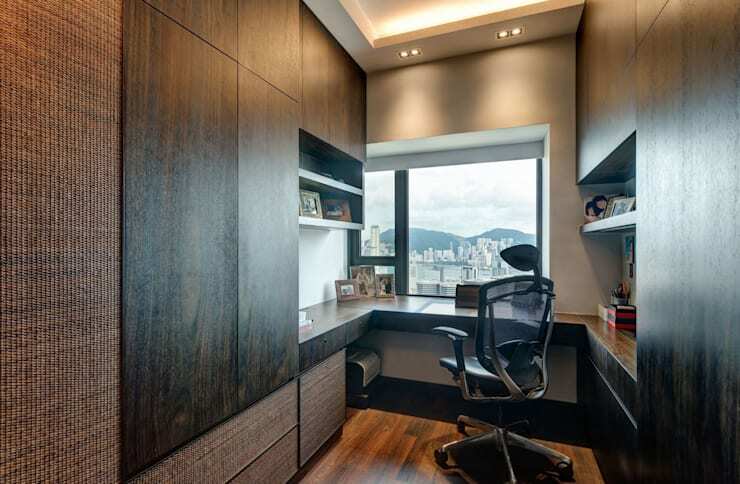 Once again, the combination of dark wood and textured walls creates a cosy sense of comfort, while the unadorned surfaces and straight edges that dominate the room anchor the design firmly in the present. 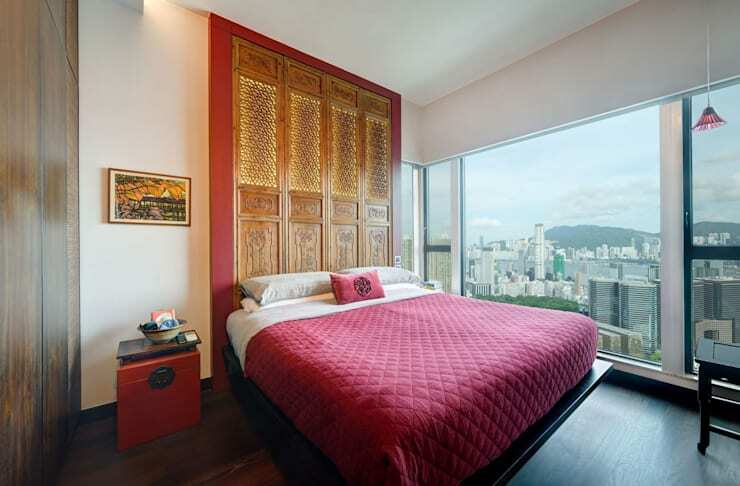 The textured walls and wooden panelling continues into the bedroom, but the standout feature of this space has to be the wonderfully intricate oversized headboard. Everything about it drips history, yet the setting in which it finds itself is a present-day one. 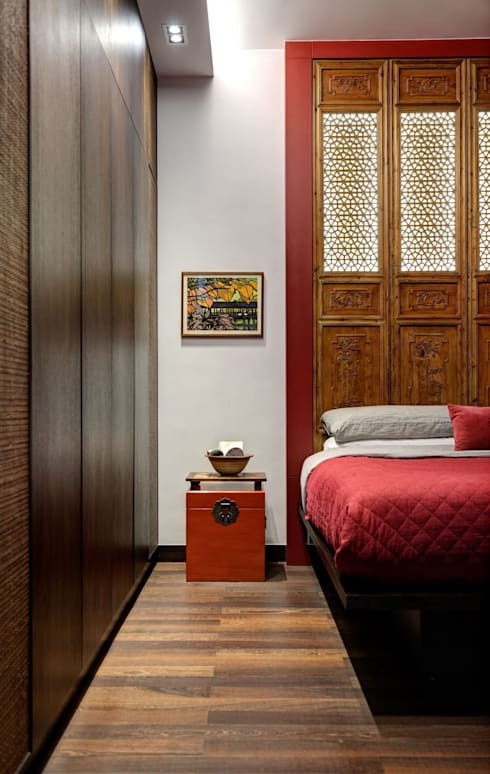 The traditionalism of the headboard is mirrored by the bedside table, which again makes use of the past conventions of Chinese design. This angle displays the headboard in all its glory, fully illuminated by the light from those giant windows. 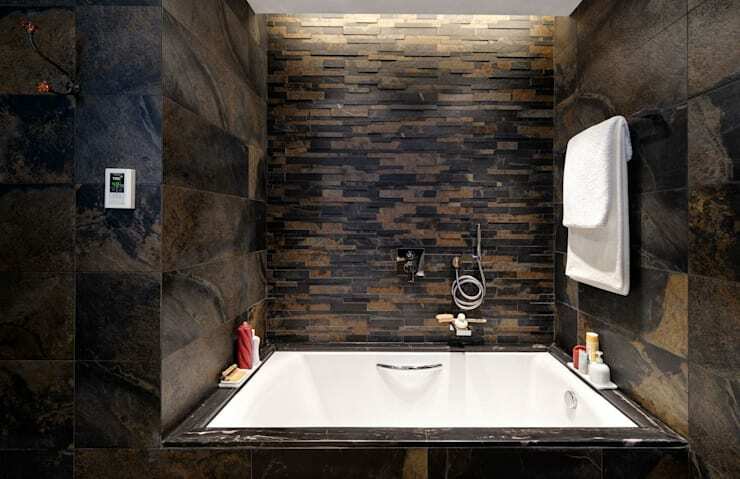 Here, as elsewhere, texture remains key, and the earthy tones that define the colour scheme of the house surface yet again, although this time via the medium of tiles and stone rather than wood and fabric. What are your thoughts on this look? Tell us!